I found out a few weeks ago that AT&T offers a 10% discount on wireless services for AARP members. I just happen to be an AARP member, and I use AT&T, so I decided it’s time to take advantage of this. I called the AT&T department that handles these things, and was talking to a nice, millennial-sounding customer service agent. She told me there was a form I had to fill out and fax to them in order to get the discount. Geezer (i.e., me): Is there a way I can just email this to you? If It Quacks Like Obstruction…. Let’s talk about obstruction of justice. There are apparently a lot of people who do not believe that President Donald Trump has been involved in obstruction of justice regarding the FBI investigations of his campaign and associates. They come up with various lines of reasoning to explain why Trump’s requests to former FBI Director James Comey to back off of his investigations are not criminal, or are not technically obstruction, or whatever. So let’s examine this a little bit. Play along with me, you will enjoy it. I see that you are a co-author of SB6. However, I am writing to express my strong opposition to this type of legislation. On the practical side: It is a waste of time and money. It is unnecessary. It will not solve any “safety” problems that it is purported to be the solution to. It is unenforceable. Its backlash, as demonstrated in other states, will cause significant harm to the Texas economy. Those are just the practical elements. But they pale beside the principles involved. The Texas Senate Committee on State Affairs has scheduled a hearing on the Texas “Bathroom Bill” (SB 6). I have visions of great crowds of people lining up to pee in the “wrong” bathrooms!! Of course, if you can’t do that, you CAN contact your senator and the committee members and tell them what a great waste of time (not to mention invasion of privacy) this is. This post has contact info. Texas SB6, the Texas “bathroom bill,” has been referred to the Senate State Affairs Committee. No date for a hearing has yet been set. 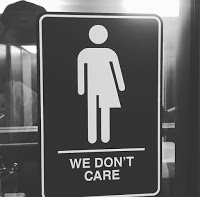 Texas “Bathroom Bill” – Go Pee in the “Wrong” Bathroom! They are planning to introduce one of those “bathroom bills” in the Texas Legislature. The bill number is SB 6. You can read it here. On the day the committee is holding a hearing on the bill, everyone should show up at the state capitol, and line up to pee in the “wrong” bathroom. Thousands and thousands of people. All going into the “wrong” bathroom to take a leak.